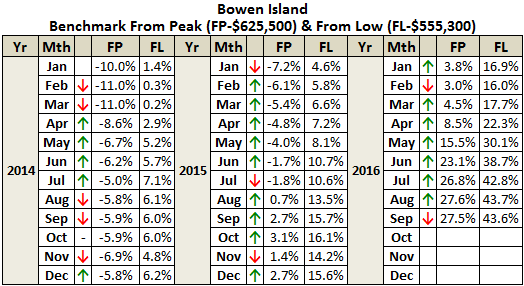 The downward momentum continues for detached sales on Bowen. 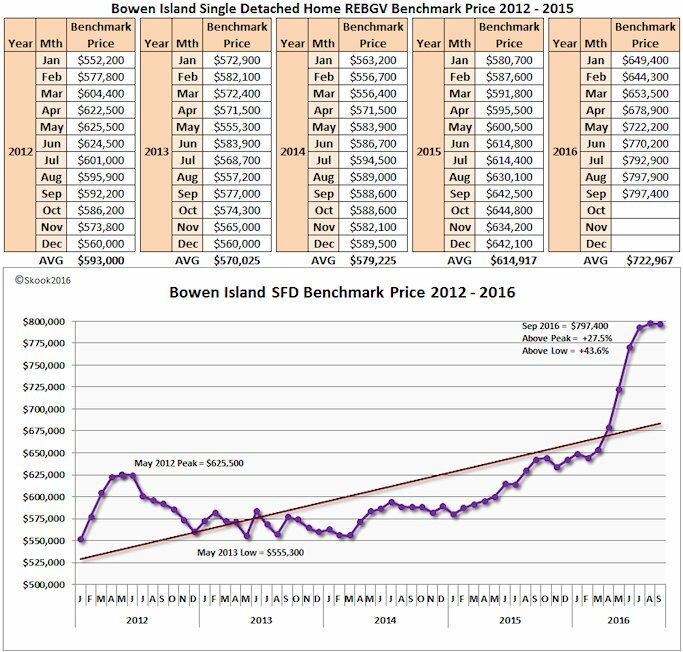 September saw 4 sales – down 2 sales from August and the benchmark sales price (that harbinger of trend – so says the Great Oracle: the REBGV) dipped $500 after establishing a new peak price in August at $797,900. However, Active Listings bucked the downward movement ending the month up 7 over August. So, we have: falling sales, falling benchmark, and rising listings; hmm, sounds like a good mix for price drops, wouldn’t you agree? 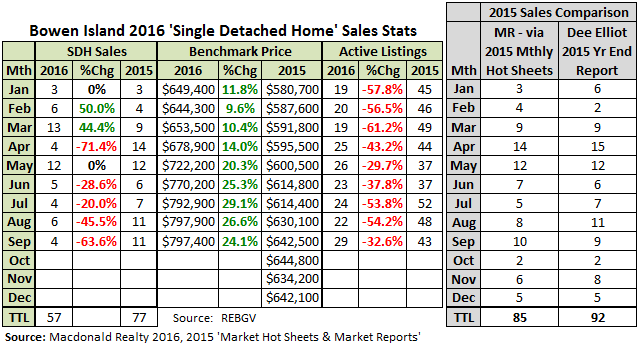 And, to rub salt into the wound, the YTD detached sales are down -26.0% compared to last year. My little comparison chart above on the right shows Macdonald Realty (MR) reported 10 sales last year in its September BI ‘Market Hot Sheet’ while BI Realtor® Dee Elliott indicated there were 9 September sales in her year-end sales summary released this past January. Now, with September's reported -63.6% year-over-year change in detached sales, MR is saying there were actually 11 sales in September 2015. One assumes MR is getting its figures from the Great Oracle...our one and only “GO” to source for real estate sales data. What gives with these revisions? Well, we might find the answer in a September 21st piece by South China Morning Post’s Vancouver based reporter, Ian Young. It’s worth taking a few moments to read the article. In sum, he says a sale that technically occurs (when a price is agreed upon) in one month will not be reported in the sales stats until all conditions are removed (sale closes) and this may not take place for weeks, months, and even in one case years later. According to Young, some lower mainland Realtors® believe this reporting model is distorting monthly sales statistics. Like I said, it’s worth the read. Next up, the year-to-date detached sales year-over-year back to 2004. As I mentioned above, YTD sales are down -25.0% compared to 2015, but are up +21.3% compared to 2014. The ‘Rolling 12 Months’ trend tool has shown, unlike the Great Oracle’s much touted benchmark sales price, that sales peaked in March and have been falling ever since. September's chart indicates the slide down is gaining momentum. Up next, the much anticipated, Realtor® pumped, Great Oracle spawned, and Garth Turner’s famed frankenumber: the MLS® Benchmark Sales Price! 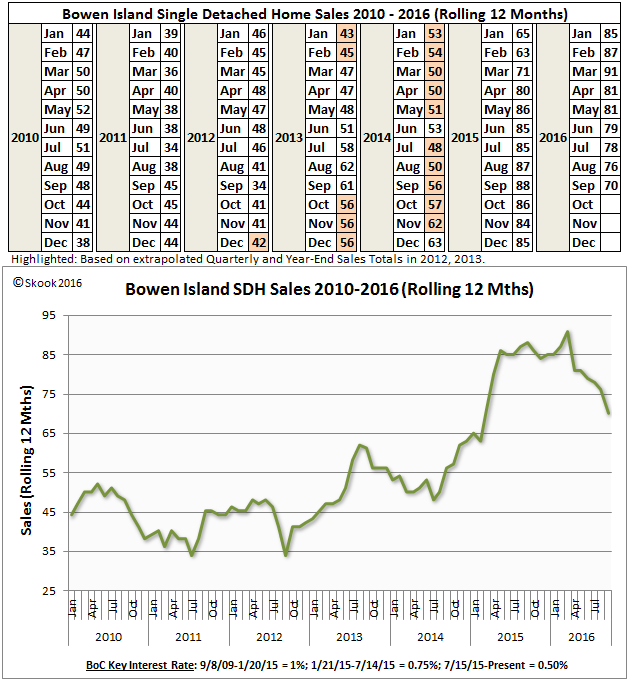 Bowen Island’s BSP had that slight dip of $500 in September and the percentage change from the May 2012 peak and the May 2013 low was minimal – only -0.1%. If the downward trend continues next month, I will begin calculating percentage change from the new August peak price ($797,900). Buckle up, looks like turbulence ahead . I've just posted reference info on the new 'Foreign Buyers Property Transfer Tax' which kicked in on Aug 2, 2016 - its here. I learned from the article that Bowen Island has not escaped the tax and any sales to 'foreign entities' on the island are subject to it. This certainly could be playing a role in BI's falling homes sales.